As we begin the season of Lent I thought you would enjoy this article by Father Jason Smith. It contains a magnificent sacred image painted by George de La Tour (1593 – 1652). La Tour is one of my favorite artists; I especially enjoy his beautiful sacred image of St. Joseph teaching the child Jesus. During his lifetime La Tour was considered to be the painter for the French nobility. His son Etienne became his pupil and followed his father’s style so closely that it is very difficult for today’s art historians to determine the author of certain paintings within their collection. La Tour was a master of the chiarascuro (light/dark/shadow) technique. He developed this technique in new ways, adopting a softer, gentler, and simple approach to presenting the interplay of light, shadow, and color. After his involvement with a Franciscan led spiritual revival he eventually devoted himself to religious subjects. His two paintings on Mary Magdalene are masterpieces of this style of art and they truly speak to the soul who is interested in listening. The de La Tour family unfortunately died in 1652 as a result of an epidemic that devastated his city. The essay below was written a few years ago by Fr. Jason Smith. Fr. Smith’s essay on the truth, beauty, and meaning of de La Tour’s painting reflects the Lord’s ability to use sacred artists to express His continual grace and mercy to us. It is my wish that you spiritually profit by the painting and its analysis. Thank you Fr. Smith for posting this fine essay. “I have found no better representation of conversion and penance in art than The Penitent Magdalene, by George de La Tour. Though simple, it expresses the essential elements behind every conversion, and we can find in it powerful lessons to apply to our own life. Let’s take a closer look. The painting presents Mary at the very beginning of her conversion, on the night that she met Jesus Christ for the first time. Her life is just as it was the day the Lord crossed her path. Yet the subtle but evocative tension in the painting makes it evident that her world has been shaken and she knows she must change. She has returned home, alone, and cannot sleep. She sits down at her vanity which until this afternoon was the center of her life. La Tour paints nothing superfluous here; only those things most dear to her, things to which she has clung for happiness and fulfillment, but that have only served to leave her feeling empty inside: Her richly embroidered clothing, her silver mirror with its carved and gilded frame, her fine jewels and her string of pearls which, while tossed aside, are still within her grasp. Interestingly enough Mary’s head is turned away from the viewer—leaving us to imagine her expression, and even better, identify ourselves with it—and, while facing the mirror, she is not looking into it. She is gazing far beyond; she has realized there is something more to life then what is external, then in those things which she has placed her security and happiness. The Lord had cast seven demons from her life, seven lies that she had believed about God and about herself; this night, however, she is finally free of them, but she knows that the changes she has to make and which still lie ahead will be hard. The flickering flame of the candle is the primary source of light. It is soft, calm, inviting, strong, and supersedes the light of an ordinary candle. It keeps the menacing darkness away. It illuminates her face and her heart—primarily her heart—to show that she has focused on the core of who she is, and subtly shows the love that she has felt that day. Yet it also shines on the mirror and on her robes and on her jewels—the light of Christ has begun to enlighten everything in her life. It is the power of the Holy Spirit through which all true conversion and penance is inspired. She holds a skull, which at first seems macabre, and certainly was not a fitting decoration for her vanity, but is symbolic of the gravity and seriousness of the assessment she is making of her life. Her hands are folded calmly upon it and it rests gently in her lap; this is not an anxious and tense conversion, but a realistic one. She knows her life will end; she recognizes her mortality; she is asking herself what is truly important in her life—not her mirror or her jewels—and she is preparing her heart to die to those things. Are we not perhaps all afraid in some way? If we let Christ enter fully into our lives, if we open ourselves totally to him, are we not afraid that He might take something away from us? Are we not perhaps afraid to give up something significant, something unique, something that makes life so beautiful? Do we not then risk ending up diminished and deprived of our freedom? And once again the Pope said: No! If we let Christ into our lives, we lose nothing, nothing, absolutely nothing of what makes life free, beautiful and great. No! Only in this friendship are the doors of life opened wide. Only in this friendship is the great potential of human existence truly revealed. Only in this friendship do we experience beauty and liberation. And so, today, with great strength and great conviction, on the basis of long personal experience of life, I say to you, dear young people: Do not be afraid of Christ! He takes nothing away, and he gives you everything. When we give ourselves to him, we receive a hundredfold in return. Yes, open, open wide the doors to Christ – and you will find true life. Conversion and penance should never be thought of as a loss but as a transformation, an exchange, for something greater: From what is bad to good, from good to better, and from better to best. In reality the Lord does not ask us to give anything up; rather, he asks that we chose the better part, to go from vice to virtue, from complaining to gratitude, from bitterness to forgiveness, from vanity to humility, from lust to love, from anger to patience, from discouragement to hope, from where we are to where we know we are called by the Lord to be. Conversion and all it entails is a calling of love and is not reached with an empty white knuckle attitude. Notice how gently her hands are folded upon the skull. It is not angst but Christ’s transforming love that impels and inspires her to change. The strength to do this does not come from within one’s own will, though the will is certainly needed, but from the light and the guidance and the power and the fire of the Holy Spirit active in an open heart. 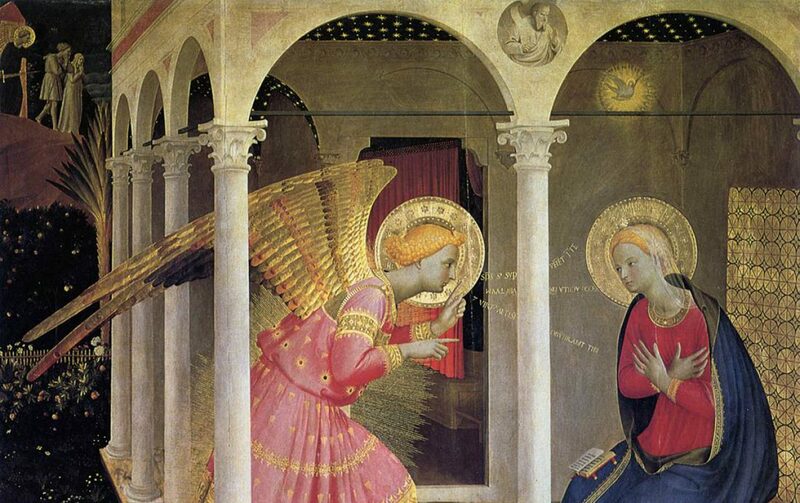 Notice how Mary’s garments show how open her heart is. Thanks for the reblog, Deacon Paul. God bless!